There are so many quick and simple ways to add a touch of summer to your home! Here’s a fun way to bring a bit of the beach to your patio – with sand and shell flowerpots and planters. 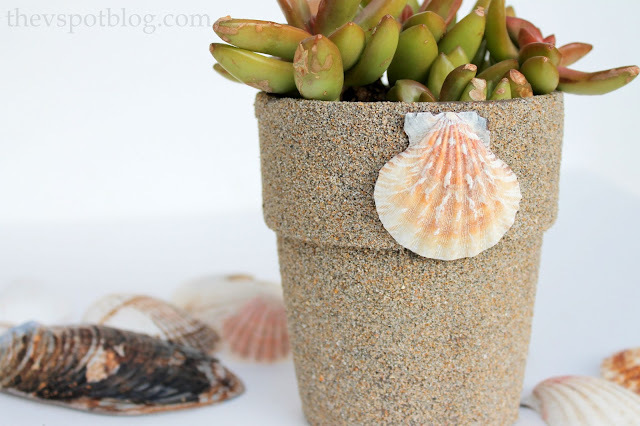 I decided to take a boring pot and make it a bit more summery with this fun coastal spin. These would be super cute table decorations for a beach themed wedding or an outdoor party. These are easy to make, and cost next to nothing to put together. This was so reeeeeee-diculously easy to do. 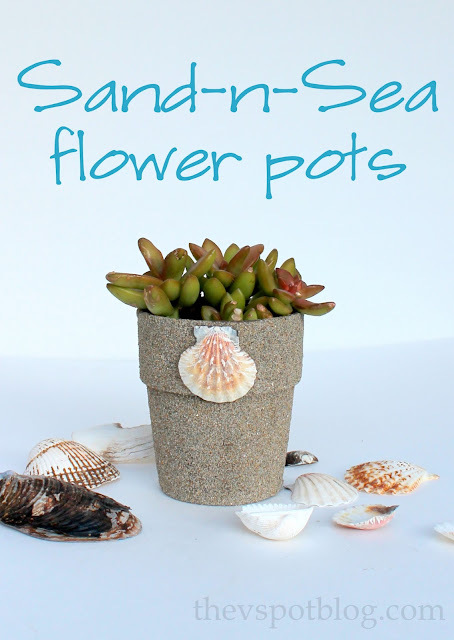 (And it’s a great way to do something kind of fun with plain ‘ol terra cotta or resin flower pots.) I live near the beach, so I can get sand for small projects whenever I need it. If you don’t live near the beach, any hardware/home/garden store will carry it. Cover your pot with glue then roll it in sand. When it’s dry you can use hot glue (for an inside pot) or a stronger adhesive like E600 (for an outdoor pot) to embellish your pot with shells. You can spray it with a clear sealant if you like. I chose to do just one shell, but the next “sandy” pot I make, I think I will put shells all along the top of the pot. Easy, cheap, and perfect for summer. Be sure to check out the tutorial for my beachy candles as well. Just as simple and easy. Happy summer! Oh how beautiful!! I love it…yes shells along the top would be fantastic. OMG, girl, you are awesome! Love your creativity! So easy and on my Island Curacao we have a lot of sand (beaches). Thank you! What a cute idea!! And in the mid-west, where we don’t have beaches, it would give us that “beachy” feel!! I’ll have to remember this for next spring/summer! !